There is no problem because the brake pads themselves are truly red pads. Above all it is cheap. This review is about item#1780747. I feel the decrease of the pad quickly, but the rotor aggression is weak by that much. I think that it is a control system pad. This review is about item#1781045. I use it on the front. The feeling is normal + alpha. Although wear is a little quick, since the price is cheap, I use the next. This review is about item#1780433. I also like the quality and the effectiveness. I hope for the revival of the rear brake shoe that has been discontinued. This review is about item#1780388. I am using it for the rear of the motorcycle (GPZ 900 R) for a long time. I also tried other products but I like it very much because the effectiveness is gentle. This review is about item#1780896. DAYTONA (Red pad) Braking power · Control performance is genuine and it is different for each stage. 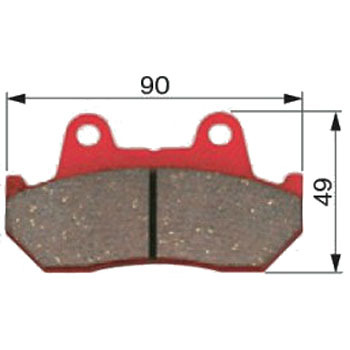 When genuine parts pads are exhausted, it is the best item for replacement. This review is about item#1780458. The effectiveness of the genuine rear brake was bad and I replaced it with a famous red pad. It is made of Daytona as expected and its effectiveness is outstanding. Later, how much do you have? Even when you change this time, it is a red pad. This review is about item#1781176. I am using it without problems. I will also use it next time. I am very satisfied. This review is about item#1780686. Used for suzuki skyweve. It arrived inexpensively and immediately. This review is about item#1781097. The front owner used a red pad, so I replaced it for a new one. It searched and purchased with catalog part number. I will install without any problem. I definitely will buy next. Thank you. The braking performance of the brake is also satisfactory. We will also consider replacing the rear. This review is about item#01780363. I am satisfied that I can use it for all weather, all round, around the front and back, using red pads. This review is about item#1780336. The rear brake is more controllability than the braking force, so the red pad is the best! This review is about item#1780792. This review is about item#1780756. I compared it with other sites, but it was very cheap, so I purchased it here. This review is about item#1780564. It is used for the rear brake of the motorcycle. Braking power, outstanding. Undisputed performance. The next purchase is also a decision. This review is about item#1780494. I attached it to Aprilia and it was attached without problem. This review is about item#1780966. I used it for replacing NINJA 250. The red pad is conspicuous and is quite nice. This review is about item#01780634. Braking at stop is better than genuine goods. I think that it is very good because it stops without locking even when sudden braking. This review is about item#01781036. I replaced it at the time of the caliper OH of the Skywave 250 CJ 44. Very cheap and thankful!